Here’s the truth. Parenting was much easier when I was raising non-existent kids in hypothetical situations. If we’re honest, it’s happened to all of us. The daydreams about what it would be like to have our little ones someday. We saw ourselves spending countless hours playing with our kids, laughing and having fun. We pinned nursery furniture on Pinterest, picked out the cutest clothes and waited with anticipation to finally get to meet our little ones. Some of us entered into this new phase of life with a list of things we adamantly said we weren’t going to do to our kids. We had strong feelings about what worked and didn’t work when we were kids. As adults, we were going to do it all differently, do it better than our parents did. Here’s the thing though: these plans are so much easier when they’re hypothetical ideas confined to the structures of our minds. Fast-forward into the future, and we find ourselves with our very own real live children, smack dab in the midst of the reality of parenting and that’s when it hits us. The daily struggle is all too real. Instead of hazily drifting from fun activity to fun activity, many moms find themselves in a constant battle of wills with their children. From cajoling them to eat, to struggling to get them to put on their shoes so you can get out the door already. For some moms, nagging, yelling and criticizing becomes a rollercoaster of habit, that as much as they try, they just can’t get off. 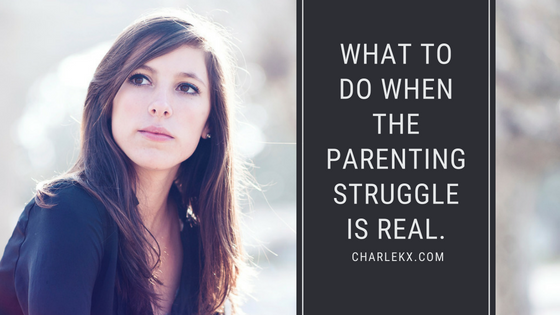 Parenting is hard, moms are chronically tired, they’re trying their best but it just doesn’t seem to be enough. They’re wracked with mommy guilt because they remember how they thought it would be but the reality isn’t measuring up and it just makes them feel absolutely crummy. So what do you do when you’re feeling stuck in this frustrating space? You’ve read the parenting books, you’ve tried the various approaches and you’re still feeling sick and tired because nothing seems to be working. I know the following approach to the daily parenting struggle will seem counter-intuitive but it’s absolutely necessary for your sanity. So what is it? What should you do? Here’s the answer…You need to simply stop. So, what do you stop? You stop trying to do it all in your own strength. You stop trying to push yourself past your limit. You stop trying to pour out of your cup, because sweetheart…it’s empty. You choose to stop. You choose to stop going on social media as much because looking at all of those other moms who seem to have it all together isn’t helping your mindset. Stop looking at their exotic Instagram filtered vacation photos. Or gourmet gluten-free, organic, vegan, locally sourced meals made from scratch. No more peeking at their Facebook feeds filled with photographs of them giving their children picture perfect childhoods. Stop looking, if when you do, you end up telling yourself that you’re not measuring up at all. Stop looking, if you’re comparing yourself to the seemingly social media super moms out there and as a consequence your inner critic is going berserk like a toddler who’s downed an entire bag of gummy worms. Stop looking; stop beating yourself up for not doing more or being more. Instead, once you’ve stopped, I want you to look at your precious children. Look into their eyes and see their truth. To them, you are enough. They look at you and are so happy to have you in their lives. You are their mom. They’re rooting for you, not some stranger online. They’re on your side. Team (fill in your family’s name here)…all the way! They’re not expecting you to be like anybody else, they’ve bonded to you. You are theirs, they are yours; you’re each others person and that’s what’s relevant. So stop; pause in this moment and welcome a feeling of gratitude and love. Let the jam flavoured hand print on the cupboard, the food that fell on the floor, the sink full of dishes, and the toys all over the place drift from your focus. Instead, stop and look into the eyes of the child you’ve held in your arms countless times and tell them three little words. These words won’t magically make everything better. You won’t wake up the next day feeling refreshed and energized and like you’ve figured it all out. What it will do is become a soothing balm for you and your little one. A reminder of what’s truly important. Once you decide to pause; once you’re ready to stop and get grounded and centred, I want you to simply say, “I love you.” Offer that gracious gift to your child and to yourself. Keep saying it over and over, when they’re a baby, a toddler, a child, a tween, a teenager and an adult. It’s a reminder that no matter the age or stage, in spite of what you’re going through, one thing remains constant, and that is your love. Yes, parenting was much easier when we were raising non-existent kids in hypothetical situations but even with the daily challenges we face now, if we’re willing to stop long enough, we’ll be able to see how richly our lives have been blessed.